The Revolution Chair incorporates a unique, patented swivel-slide technology allowing easy access to the chair and table edge without moving its legs. The chair swings open to accommodate its user. It then slowly turns to face the table and gradually slides forward until the user is 150mm (standard) distance from the table edge. When the user wishes to exit the chair, a tab on the side of the seat is pulled and the seat gradually slides back from the table. Then the seat turns away from the table and the user exits the chair. 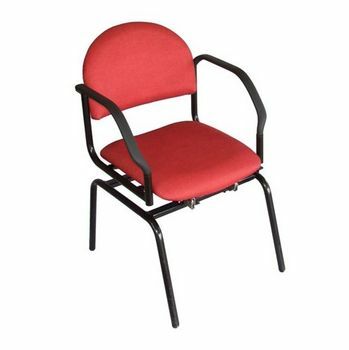 As the name truly indicates this revolutionary chair, gives users greater independence, saves money by staff having to spend less time sitting residents for meals and fewer strains and sprains for carers trying to manoeuvre the user into a seat and up to the table.